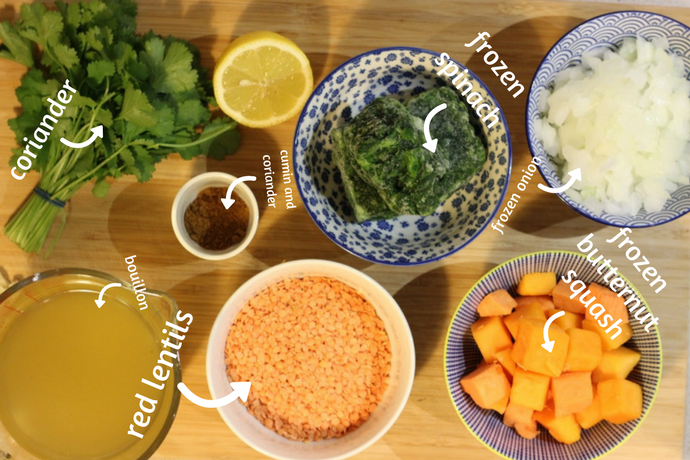 Quick, easy, healthy and vegan, this red lentil dahl is great for batch cooking and eating throughout the week. We get some great opportunities with the blog, trying out new fitness classes and races around the country, testing new running shoes, going to the Faroe Islands, but this opportunity is probably one of the ones we’ve got most excited about. Iceland (the shop, not the country) asked us to create a healthy new year recipe for them using some of their products (recipe’s at the bottom). One step closer to our own cookery show! They asked us to focus on helping people prep healthy, fresh meals for the week. Ideal! 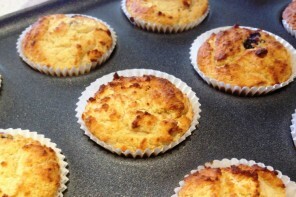 One of my (Charlotte) favourite things to do on a Sunday afternoon is to follow a new recipe or buy random ingredients from the supermarket and create a big batch of something to eat throughout the week. I love cooking with ingredients I’ve never used before so one of the things I was particularly interested in with this challenge was trying new frozen foods. As a vegan, I usually just head straight for the fresh food aisles and the only frozen things I really use are edamame beans, peas, good old Linda McCartney sausages (and Birdseye potato waffles for a hangover day). Turns out, this is a bit of a mistake. Emma, also loves cooking from scratch but she’s always so busy with work that she’s all about the convenience. She has a freezer full of fish and frozen-for-freshness vegetables so she can make something quick and healthy whenever, without having to go to the supermarket. It was Emma that explained to me that frozen-for-freshness veg aren’t cooked – so nothing like those soggy pea, carrot and cauli mixes from school days. They’re just frozen pretty sharpish after being harvested so that you can keep them in your freezer for convenience and to reduce food waste, so actually they’re probably fresher than most of the veg in the fresh food aisle and you don’t end up throwing half away when you’ve been out most nights in the week. 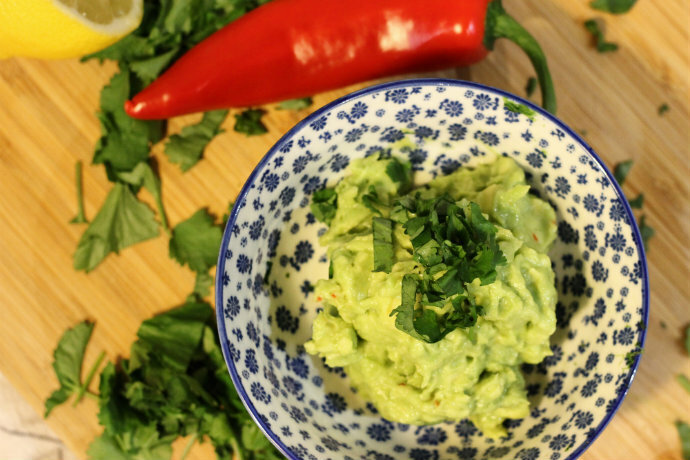 You can also get frozen avocado halves – mind blown! This broccoli comes frozen, good eh? So this weekend we went on a romantic shopping trip to Iceland together – where we got to push the world’s smallest trolley. Frozen food gets a bit of a bad rep sometimes and yes, while there were plenty of turkey dinosaurs (and you can also get frozen Greggs products!) we came away with loads of cool stuff. Frozen-from-fresh butternut squash chunks and sweet potato chunks, frozen cauliflower rice, some amazing frozen tender stem broccoli, whole leaf spinach and those frozen avocado halves (we made guacamole with them and they’re actually great, not sure you can eat them as a fruit on their own but in smoothies and dips they’re fab). If you order online or go to a bigger store there’s even more choice and you can get frozen multi-greens rice made from seaweed and greens and frozen quinoa mixes, lean ostrich fillets and loads of fish. 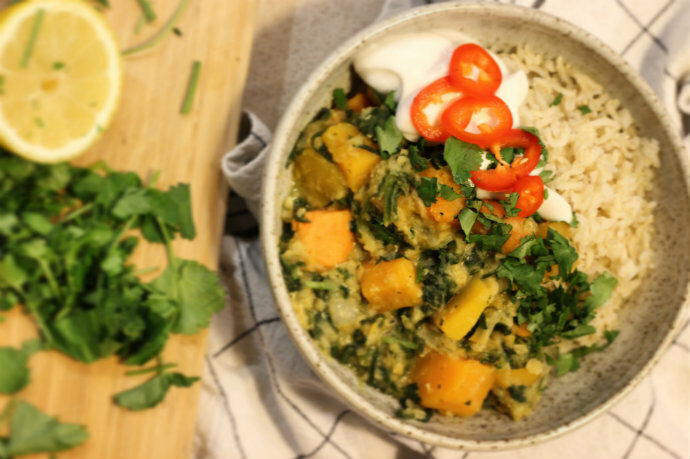 With our haul and a few store cupboard ingredients we created this lovely comforting vegan dahl. We know it’s good because Emma’s boyfriend came round and ate the whole lot after we’d finished. It’s full of protein and fibre-rich red lentils and gentle warming spices, and is lovely and comforting on a cold day. 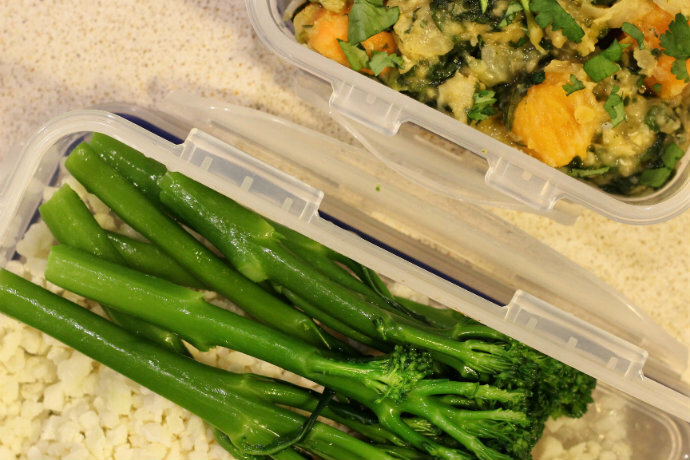 Nearly all the vegetables we used were frozen – so there was no chopping – making it really quick and easy to make. It’s also cheap as once you’ve got a bag of red lentils they last forever. 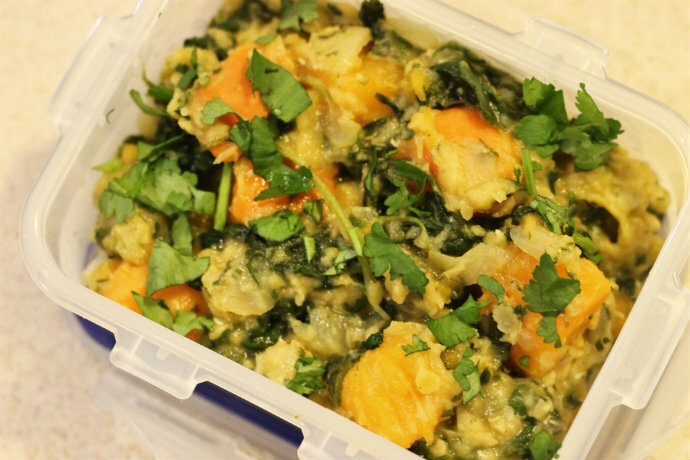 The frozen veg worked really well – the only thing we weren’t too keen on was the frozen onion – but you can supplement any for the same weight of fresh or, in the case of the spinach, three or four big handfuls. You can also experiment and mix and match your veg and spices – sweet potato or carrots would work well instead of butternut squash and you could try broccoli, peas, or greens instead of spinach and maybe add turmeric or garam masala. 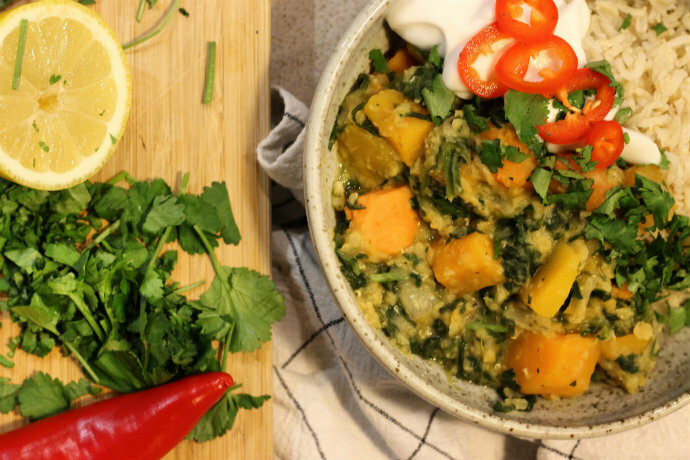 If you want to eat our dahl throughout the week, here are some serving ideas. Comforting, warming and super-quick and easy to make, this is a great recipe to make on a Sunday and eat throughout the week. This makes two large or three smaller portions. Add red lentils and stock and bring to the boil. Reduce heat and simmer for around 20-25 minutes depending on the cooking time of your lentils. After 10 minutes add butternut squash to the pan of lentils, cover and simmer. If becoming too dry, add some more water. Five minutes before the end of cooking add frozen spinach, cover and continue simmering. When your lentils and vegetables are cooked remove from the heat. Add the juice of half a lemon (or more or less according to your taste) season with salt and black pepper if required. Chop around 25-20g of the fresh coriander and stir into dahl. Serve with brown rice and garnish with coconut or natural yogurt, sliced red chilli and a sprinkling of the remaining coriander. This is a sponsored post produced in collaboration with Iceland. As always, all opinions are our own and we only work with brands we believe in.